11" x 17" reproduction of watercolor rendering of the historic Baldwin House. 9" decorative plate features a replica of the 1979 artist's rendering of the utopian community of Celestia. Ceramic two-cup teapot with a black and white image of the historic Baldwin House. 6" square ceramic tile with black and white image of the historic Baldwin House. Cork back and suitable for hanging. 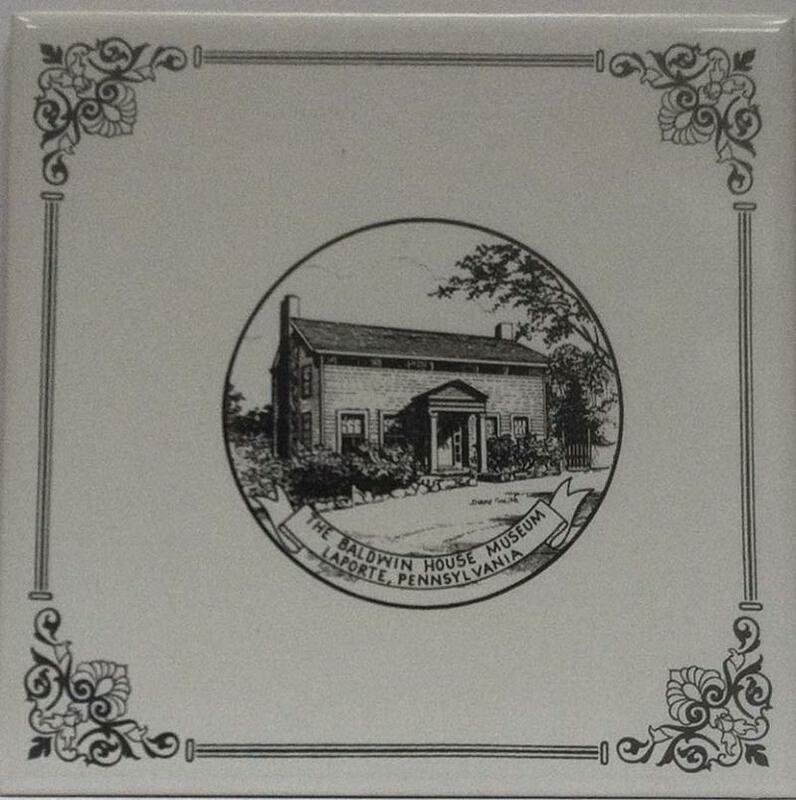 6" square ceramic tile with black and white image of the Sullivan County Courthouse. Cork back and suitable for hanging. Ceramic 3.5" trinket box with black and white image of the historic Baldwin House on the lid. Ceramic 3.5" trinket box with black and white image of the Sullivan County Courthouse on the lid. Ceramic 3.5" paperweight with black and white image of the historic Baldwin House. Ceramic 3.5" paperweight with black and white image of the Sullivan County Courthouse. Originally published in 2003, this calendar documents the history of Laporte with text and images. 100% cotton, short sleeve polo shirt with embroidered logo of the Sullivan County Historical Society. Currently available in adult sizes small, medium, and extra large. Items are available for purchase by credit card or PayPal account by clicking on the "Paypal Buy Now" button below each item.